Think of our veterans on this Remembrance Day. During all my teenage years I was a member of the 186 Royal Canadian Air Cadet Squadron. I think this shaped the way that I am today. We learned to pay respect to our elders, to help those you saw in need. to speak in turn, and many other values. It kept me so busy that I didn’t have time to get “bored” like a lot of kids now a days that are not involved in clubs. We were lucky enough that our squadron had funding from the lotteries so that ment that we got to go on many trips. The trip to Spokane Washington was my most memorable. In fact my years in cadets were filled like this…Monday night… Drill Practice, Tuesdays… regular cadet night, Wendsday…Band, Thursday…. Drill practice and Sundays…Drill Practice. Unless there was a Sport or Drill Competition that had us traveling all over Saskatchewan. Summer vacations had me going to 2-6 week camps the older I got the longer the camps. Being affiliated with the Canadian forces each November we would sell poppies for the Royal Canadian Legion. On November 11 we would take part in the parade and the Remembrance Day services at the local cenotaph. This is the Lloydminster Ab. cenotaph that we visited each year. 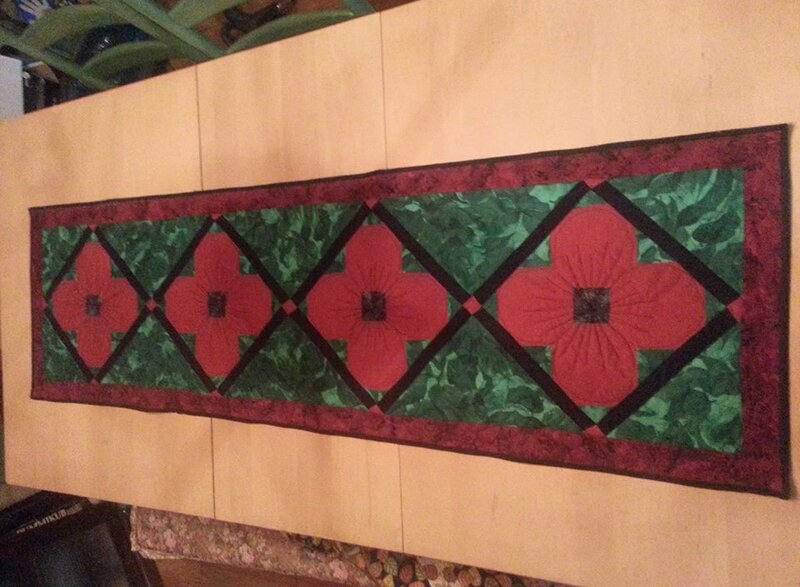 As a reminder of these years I have drafted up this poppies runner for your enjoyment.